This post could not have happened without the kind help of Mark Kausler. 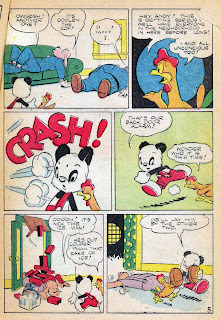 He scanned his disintegrating copy of New Funnies #83 for me. Thank you sincerely, sir! 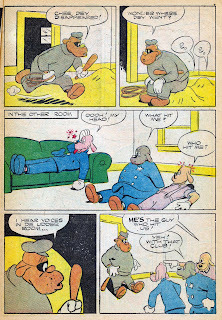 Since these early New Funnies have less John Stanley content, more pablum, and command high prices on the accursed "collector's market," they're seldom encountered. 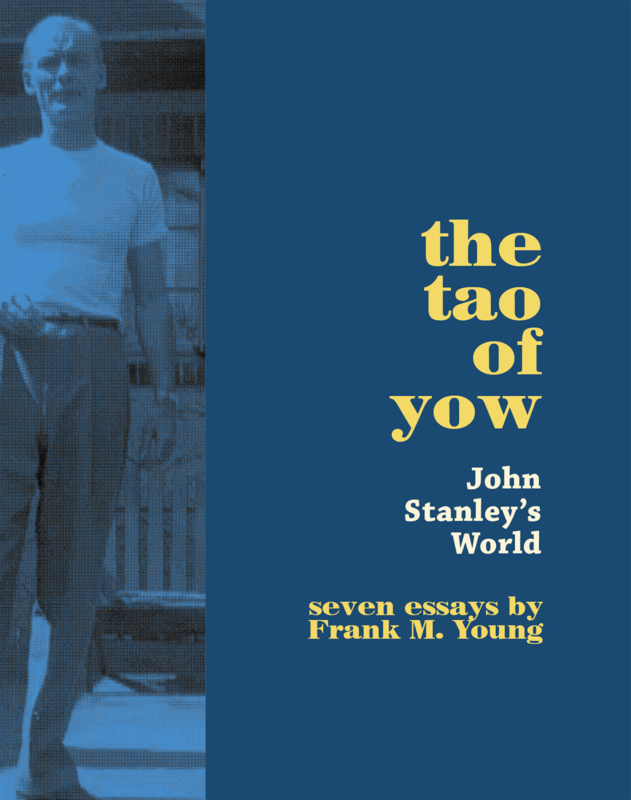 The Stanley material is worth studying and reading. As well, since these early stories will, likely, never be reprinted (Universal Media--'nuff said! ), I feel duty-bound to present them here, as I acquire them. 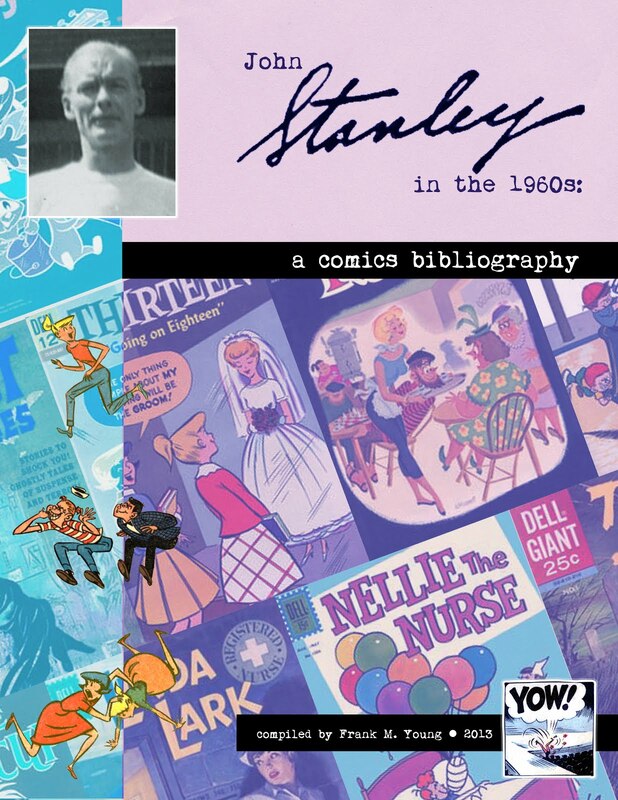 To fully appreciate how good these early Stanley stories are, one must attempt to read some of the New Funnies issues that preceded Stanley's run. They are competent, sometimes lovely to look at, but achingly devoid of strong content. 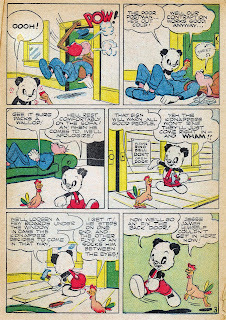 Even the one "Andy Panda" story Carl Barks drew is gormless, la-de-dah stuff. 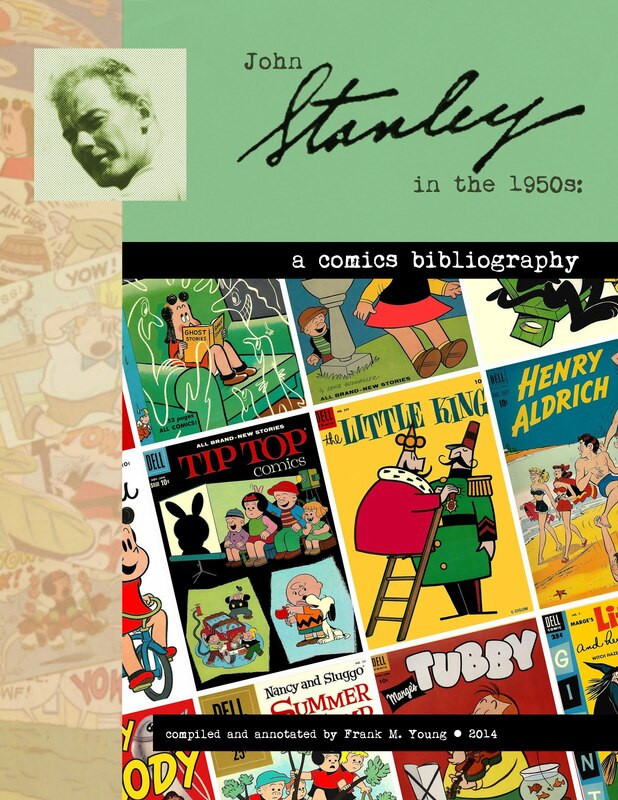 Although these earliest Stanley stories lack the intensity of focus, and the fearless tragicomedy of his best work, they are an enormous improvement on the stories that preceded them. Storage space is at a premium here on Blogger. At some point, I'll use up all my alloted space here, and have to create "Stanley Stories II"--or else break down and buy some storage space on the Internet. Otherwise, I'd post a couple of the pre-Stanley "Andy" stories, just so you can appreciate the upgrade Stanley brought to the table. 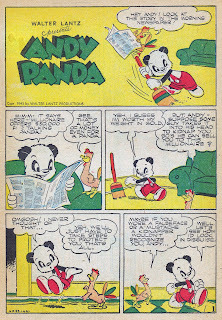 This is John Stanley's fifth "Andy Panda" story. 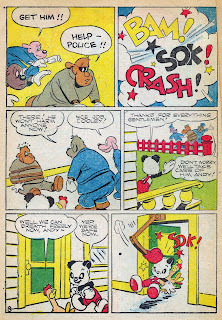 It's among the most Carl Barksian of his early work. I honestly don't know if Stanley followed Barks' work, or, if so, what he thought of it. Perhaps it's a zeitgeist thing. 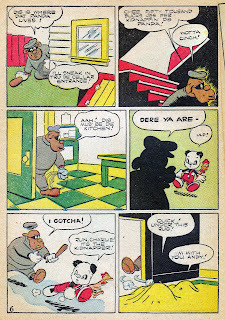 There is an undeniable crossover in themes and characterization in the pre-1945 work of Barks and Stanley. Early on, both men frequently fashioned stories from flimsy premises. They infused them with enough slapstick, chutzpah and characterization to transcend their usually weak starts. The story's premise--of a rich person ready to fork out big bucks for a talking panda--is a limp noodle of an idea. It's only there to set up the sublime chain of events that follow. Andy and Charlie fortify their cottage--with fatal potential--and leave an inverted invitation that summons person after person through their portal. 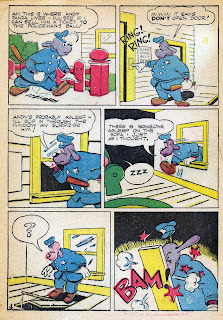 Postman, iceman, and cop are rendered unconscious in the cute couple's living room. The stakes are surprisingly low here. Stanley had not sufficiently developed as a writer to make the most of his own plot devices. The story is more about the event of KO-ing these three scions of civil service--which is funny enough for a 1943 Dell comic. The story's ending is an early instance of the Stanley off-beat. 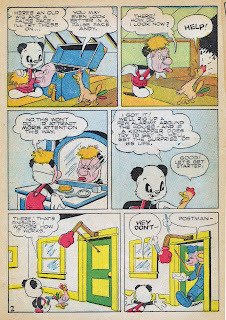 It would make more sense, from a traditional story structure (and comedy structure) to have one more panel showing the comatose panda out like a light, with Charlie Chicken fretting over him. Instead, our ostensible hero gets clocked with the Rube Goldberg-style contrivance. The look of "oh, sh!t" surprise, in that last panel, is a nice touch. No masterpiece here--just a young comic book writer still learning the ropes. 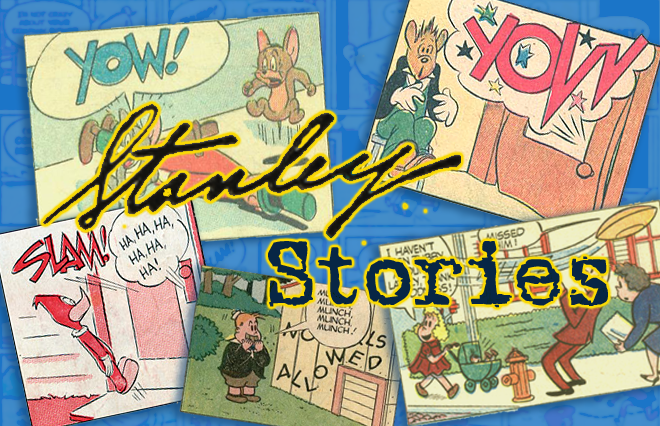 Even in his most larval state, Stanley upped the quality of the funny animal genre. 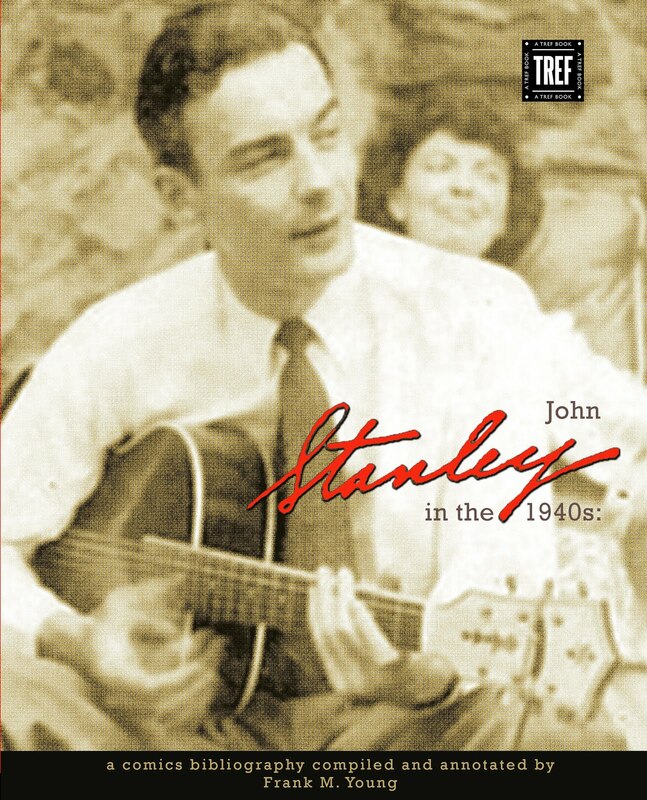 John Stanley's earliest work should, by no means, be dismissed. Haw! That was a really funny one! You're right, I can totally see the Barksian mixed with the Stanleyse in this story. The 'limp noodle' idea of a talking panda being unique could have been played for some really meta-humor. Thanks to you and Mark for sharing this one!